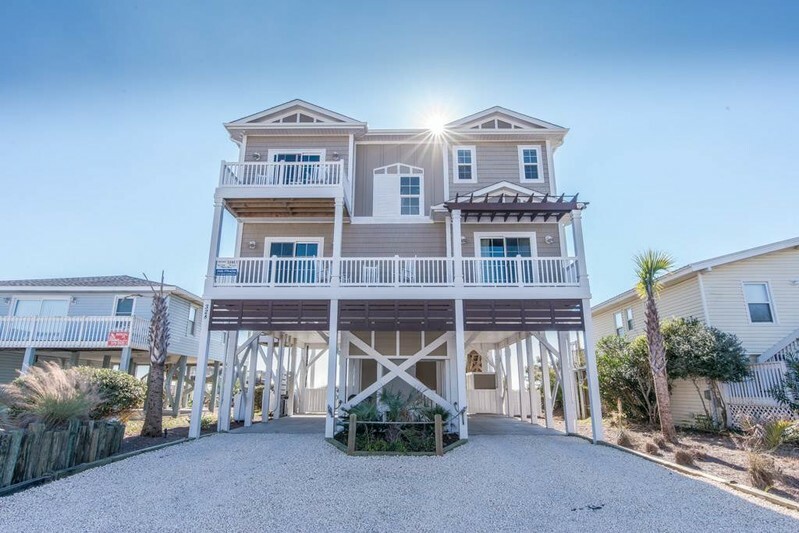 LUXURY OCEANFRONT HOME - 5BR/5.5BA, SLEEPS 18! Professionally decorated oceanfront five bedroom, five and a half bath reverse floor plan home with private pool. Elevator that accesses all floors. Four bedrooms on the first floor, and one master on the second floor. Open kitchen and living space on second floor to take advantage of the commanding views of the Atlantic Ocean with 180 degree panoramic views! Fully equipped kitchen with granite countertops, stainless appliances, double oven, refrigerator, dishwasher, microwave and so much more. Comfortable accommodating 18 people in two master bedrooms, one upstairs and one downstairs, and three other bedrooms. Bedding configuration: Upstairs master is a King, Downstairs master is a King, Queen/Queen, Queen/Queen, 2 sets of bunk beds (4 singles), sleeper sofa in second living space downstairs. All bedrooms have their own private balcony, bathroom and television, making getting away together that much more enjoyable! Secondary living space downstairs allows for additional sleeping with a queen sleeper sofa, and television area for the kids. Stay connected and entertained during your vacation with wireless internet access, smart flat panel televisions, Blu-ray players. Outside enjoy your own private pool and outside living space. A large outside charcoal grill makes entertaining easy. Plenty of lounge chairs by the pool and a dining table for eating al fresco. Lots of rockers on the porch to take in setting. Private walkway to the beach. Heat the pool Oct - May for $150/day. All bed and bath linens provided during your stay. Non-smoking, no pets. Reserve your week today before it's too late.